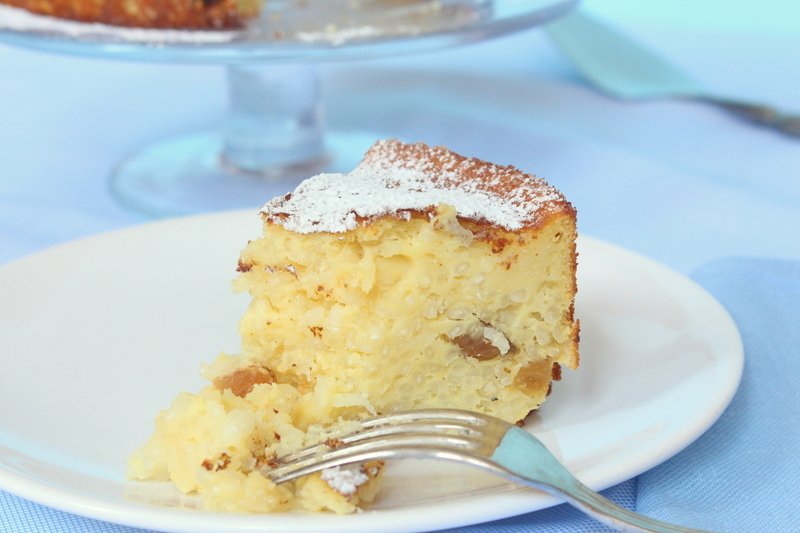 A light and delicious cake, perfect for a gluten-free diet. The rice cake is an Italian classic, prepared with some variations in the different regions of Italy The recipe that I am proposing is typical of Emilia Romagna; in the past it used to be prepared only at Easter, but nowadays we eat it all year long. It is too tasty for just one occasion! Actually I like it as a summer dessert because of its fresh lemon taste. The simple recipe with milk and rice can feature a variety of different other ingredients, according to your personal tastes (see note). The rice I use is the Arborio or Carnaroli rice, rich in starch, that gives a smooth texture to this dessert. The traditional recipe calls for some butter (about 3 tablespoons); I omit it to make the recipe lighter. You can serve it as a dessert after dinner, or I also like it as an afternoon snack with a good cup of coffee. Preheat oven to 160 °C. 5. Coat the bottom of a spring form pan (diameter 18 cm, 7 inch) with a disc of baking paper and pour in the mixture. Bake for about 45 minutes, until the surface is golden and a knife inserted in the middle comes out clean. Allow to cool on a rack. As soon as the cake is cool, loosen the cake from the pan by running the blade of a knife around the edges, and then release it. Remove the baking paper. Place on a serving plate and enjoy! I bet that many of you have eaten Tuscan cantucci, the hard and crunchy, twice-baked cookies, at least once. They are often served as an after-dinner dessert to dunk in Vin Santo, a fortified sweet wine made with Trebbiano and Malvasia grapes. Cantucci are also called Prato cookies and are a masterpiece of traditional Tuscan confectionery. Cookies are made by cutting a roll of freshly baked dough diagonally, which is then put back in the oven for a few minutes to brown. The dough is simple and requires eggs, sugar, flour and almonds. My recipe also includes the addition of a tiny amount of butter and baking powder; these ingredients make the dough softer, so your cookies will be less dry and more crumbly. In my opinion the lack of fat in the traditional recipe makes the cookies too hard. The name cantucci derives from canto in Italian (corner) or cantellus, a Latin word meaning a slice of bread that the Roman soldiers consumed as part of their meal. But the real sweet cookies first appeared in the second half of the sixteenth century at the Medici court in Florence, though the recipe did not contain almonds. Some centuries later almonds were added, and then at the beginning of the 1900s production started on a large scale. 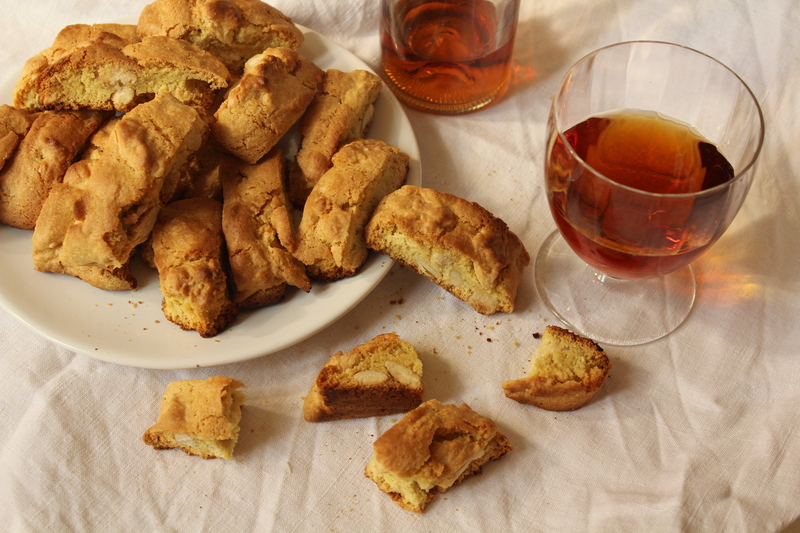 Nowadays cantucci are enjoyed all over the world and are the emblem of Italian cuisine. They have only one defect: they are too good – one leads to another, and when you start it is hard to stop! They are a real temptation, resistance will be futile! 2. In a large bowl mix dry ingredients such as flour, baking powder and salt. Set aside . 5. At this time, remove from the oven and cut diagonally into about 1-1.5 cm (½ inch) wide cookies. Bake again for about 5 min. Remove from oven and let cool on a rack . Eat when they are completely cold. This delicious and fresh strawberry tart is prepared with an almond-flavored dough (pasta frolla), filled with custard and then decorated with fresh strawberries for a tasty and colorful touch. It is a water-mouthing dessert to serve on a special occasion such as the Mother’s Day! But this is a classic for any other occasion too, such as a birthday party or a dinner with friends. The preparation of this tart is not difficult, but it requires a bit of patience and some creativity in decorating. The look and the taste are worth it! May 12th will be Mother’s Day in most countries, and we like to celebrate this special day by preparing something special. Mother’s Day actually has pagan origins and dates back to ancient times. Even the Greeks and the Romans dedicated one day each year to their parent. In Italy the first celebration was in Assisi in 1957, and since then it has been in our calendar on the second Sunday of May. This day is a very special day, all mothers should be surrounded by love, attention and gratitude, and of course delicious food! 7. 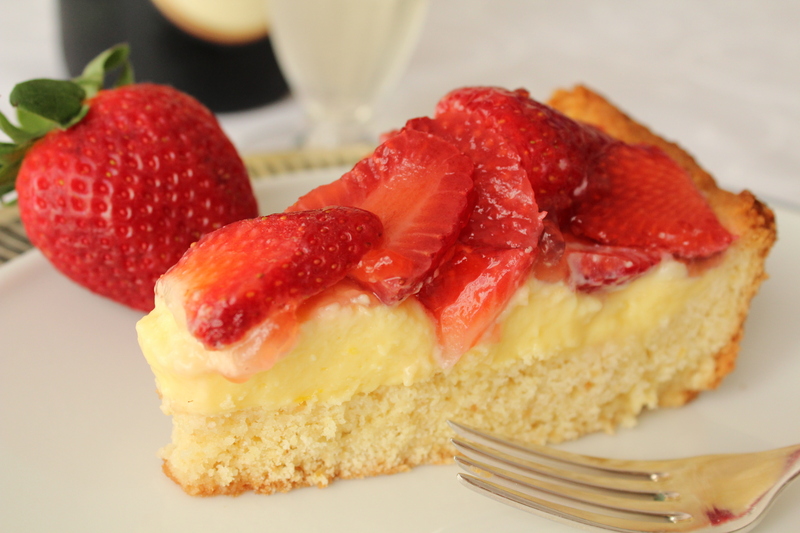 Put the strawberry tart to cool in the refrigerator for at least an hour. 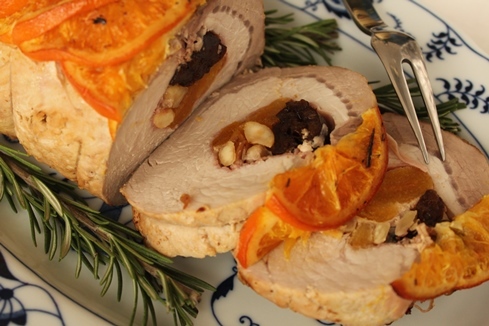 Roasted pork tenderloin stuffed with dried fruits soaked in Marsala wine, ham and almonds: an elegant and delicious recipe for a family get-together or a special occasion … something to impress your family and guests! You will love how beautiful the colors of the ingredients look when you slice it – we all know that we eat first with our eyes!!! The mingling of dried fruit, almonds and Marsala is mouth watering and recalls Sicilian flavors. In fact, Sicily is one of the most important producers of almonds in the world. Almonds, the symbol of good fortune, were first cultivated in the Middle East, then introduced in Sicily before 1000 BC. Further, Marsala, a fortified sweet wine similar to Port and Sherry, is produced in the region surrounding the city of Marsala in Sicily. This wine is a perfect complement to sharp cheeses, nuts, desserts or cooked meat (chicken Marsala is one of the most common dishes). The sweetness of Marsala gives this pork dish a fabulous and unexpected flavor. Before cooking the roast, let stand unrefrigerated until it reaches room temperature. 6. Bake uncovered at 205 °C (400°C) for 5 minutes. Reduce heat to 180 °C (350 °F), cover with aluminum foil and bake for an additional 40 min. Use a meat thermometer to determine when it reaches your preferred level of doneness (70°C/160°F for medium). Uncover and place under broiler to brown the top for about 5 min. 7. Transfer to a cutting board. Let it stand for about 10-15 min. Remove the strings and slice it. You can serve with baked potatoes, mashed potatoes and grilled vegetables. The Pan dei Morti are traditional Italian cookies prepared for the Day of Dead (Commemorazione dei Defunti) celebrated on November 2nd, the day following All Saint’s Day (Ognissanti). On these two holy days Italians honor the souls of deceased relatives and loved ones, and many believe that the spirits return to Earth to visit those ones they have left behind. In fact, the use of other cookies (amaretti and savoiardi) or left over sweets as ingredients clearly symbolizes the transmutation of the old into the new. It is also interesting to note that dried fruit and figs, also fundamental in this recipe, were always present in pre-Christian offerings to dead people. Cacao is a modern acquisition to render these sweets as dark as the earth in a burial ground. In ancient times, honey, browned on the stove with a little butter, was used to get the same result for color and sweetness. The Pan dei Morti recipe has as many variations as there are regions in Italy, and this particular one is a specialty of my own region, Lombardia. Preparation time: 40 min. Baking time: 15-20 min. Finely grind the almonds, and then separately grind the figs as well. Add both to the cookie mix (the damp figs may clump together; just add the clumps into the dry ingredient mix). Add raisins. To form the cookies, first flour your fingers. Scoop out a ball of dough of a size somewhere between a golf ball and a tennis ball. Using as little flour as possible flatten the ball into an oblong shape with pointed edges, about 4 ½ -5 ½ inches (12-14 cm) long and about 2 ½ inches (6 cm) wide. Use just enough flour to work the dough and keep the cookies from sticking to the baking paper. Remove from the baking sheet and cool on a rack.